Matthew Stephen "Matt" Leinart (born May 11, 1983) is a former American football quarterback. He played college football at the University of Southern California (USC) from 2001 to 2005. He was the starting quarterback for the USC Trojans in 2003, 2004, and 2005. As junior in 2004, he won the Heisman Trophy. Leinart played professionally in the National Football League (NFL) for the Arizona Cardinals (2006–2009), Houston Texans (2010–2011), Oakland Raiders (2012), and Buffalo Bills (2013). Leinart signed a deal with the Pac-12 Network, making his official debut as a Studio Analyst on August 30, 2014. He is a recurring guest, via voicemail, on the Barstool Sports podcast Pardon My Take. Leinart was born in Santa Ana, California, with strabismus (commonly known as "crossed eyes"); his left eye was not aligned correctly with his right. He underwent surgery when he was three years old and was fitted with special glasses to correct the problem, but the eyewear combined with Leinart's already-overweight frame made him an easy target for other children's ridicule. "I used to get made fun of for being cross-eyed. It's just a terrible thing because kids are so cruel to the fat kid, to the kid with the glasses. So I turned to sports," he would later say. Leinart attended Mater Dei High School and was a letterman in football. As a junior, he led his team to a California Interscholastic Federation (CIF) Division I co-championship and was named the Serra League's Offensive Most Valuable Player. Wearing number 7, he was chosen as the Gatorade California high school football player of the year. As one of the nation's top college football recruits, Leinart committed to USC under coach Paul Hackett, noting that a major factor was offensive coordinator Hue Jackson. However, after Hackett and most of his staff were fired in 2000, Leinart considered other programs such as Georgia Tech and Arizona State and visited Oklahoma before USC eventually hired Pete Carroll. Leinart attended the University of Southern California, where he played for coach Pete Carroll's USC Trojans football team from 2001 to 2005. He redshirted in 2001. As a freshman the next year, he understudied senior quarterback Carson Palmer, who went on to win the Heisman Trophy and was drafted by the Cincinnati Bengals in the 2003 NFL Draft. Leinart appeared in only a few plays in 2002 but did not throw any passes. As a sophomore in 2003, Leinart competed with redshirt junior Matt Cassel, who was Palmer's backup the previous season, and Purdue transfer Brandon Hance for the vacant starting quarterback position. Going into the season, Carroll and his coaching staff selected Leinart, not because he had set himself significantly ahead of the pack in practice, but because they needed a starting quarterback. When the coaching staff told Leinart he would be the starter, he replied, "You're never going to regret this." There was some thought in the press that Leinart would merely hold the starting position until highly touted true freshman John David Booty, who had bypassed his senior year in high school to attend USC, could learn the offense. Leinart's first career pass was a touchdown against Auburn. He would win the first three games of his career before the then-No. 3 Trojans suffered a 34–31 triple-overtime defeat at California on September 27 that dropped the Trojans to No. 10. Leinart and the Trojans bounced back the next week against Arizona State. Leinart injured his knee in the second quarter and was not expected to play again that day, but he returned to the game and finished 12-of-23 for 289 yards in a 37–17 victory. Leinart and the Trojans won their final eight games and finished the regular season 11–1 and ranked No. 1 in the AP and coaches' polls. However, USC was left out of the BCS championship game after finishing third in the BCS behind Oklahoma and LSU. The Trojans went to the Rose Bowl and played University of Michigan. Leinart was named the Rose Bowl MVP after he went 23-of-34 for 327 yards, throwing three touchdowns and catching a touchdown of his own. The Trojans finished No. 1 in the AP Poll, winning the AP national championship. In 13 starts, Leinart was 255 for 402 for 3,556 yards and 38 TDs with 9 INTs. He finished sixth in the Heisman voting. The Trojans started Leinart's junior season (2004) with victories in their first three games. On September 25, the Trojans played Stanford University. After Stanford took a 28–17 halftime lead, Leinart sparked the offense with a 51-yard pass to Steve Smith and scored on a one-yard sneak to cut the Cardinal lead to four points. Leinart and the Trojans were able to take the lead on a LenDale White touchdown rush and hold on for the victory, 31–28. Leinart completed 24 of 30 passes. He finished the final regular season game against UCLA, but was held without a touchdown pass for the first time in 25 starts. Nonetheless, Leinart was invited to New York for the Heisman ceremony, along with teammate Reggie Bush, Oklahoma's freshman sensation Adrian Peterson, incumbent Heisman winner Jason White, and Utah's Alex Smith. 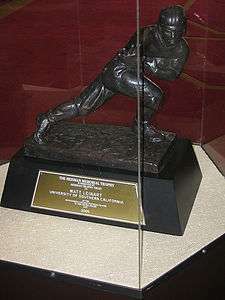 In what many had considered one of the more competitive Heisman races, Leinart became the sixth USC player to claim the Heisman Trophy. In 2004, USC went wire-to-wire at No. 1 in the polls and earned a bid to the BCS title game at the Orange Bowl against Oklahoma, which was also 12–0. A dream matchup on paper (including White vs. Leinart, which was to be the first time two Heisman winners would play against each other), the Orange Bowl turned out to be a rout, as Leinart threw for five touchdown passes on 18-for-35 passing and 332 yards to lead the Trojans to a 55–19 victory. 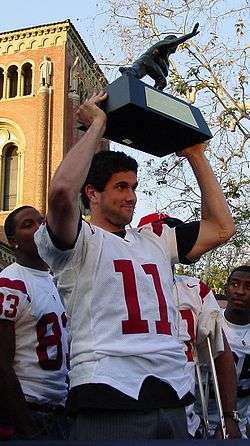 Leinart received Orange Bowl MVP honors and the Trojans claimed their first BCS national championship and second straight No. 1 finish in the AP, extending their winning streak to 22 games. This victory and BCS championship was later vacated as a result of the Reggie Bush scandal (though the AP national championship still stands). The 2005 Trojans again had a perfect 12–0 regular season. Against Notre Dame, Leinart threw for a career-high 400 yards. After an incomplete pass and a sack led to a fourth-and-nine situation with 1:36 left—at the Trojans' own 26-yard line, Leinart called an audible "slant and go" route at the line of scrimmage and threw deep against the Irish's man-to-man coverage, where Dwayne Jarrett caught the ball and raced to the Irish' 13-yard line, a 61-yard gain. Leinart moved the ball to the goal line as time dwindled and scored on a quarterback sneak that gave the Trojans a 34–31 lead with three seconds to go, giving the Trojans their 28th straight victory and one of the most memorable and dramatic finishes in the history of the Notre Dame–USC rivalry. Leinart was again invited to New York for the Heisman ceremony along with teammate Reggie Bush and Texas quarterback Vince Young. As a former Heisman winner, Leinart cast his first-place vote for Bush, and ended up third in the voting behind Bush (since vacated) and runner-up Young. The Trojans advanced to the Rose Bowl to face Vince Young and No. 2 Texas in the BCS title game. The title game was considered another "dream matchup." Leinart himself had a great game, going 29-of-40 for a touchdown and 365 yards, but was overshadowed by Young, who piled up 467 yards of total offense and rushed for three touchdowns, including a score with 19 seconds remaining and two-point conversion to put the Longhorns ahead, 41–38. The Trojans lost for the first time in 35 games, and Leinart for just the second time in his 39 career starts. After graduation, Leinart's No. 11 jersey was retired at USC. Leinart finished his college career with 807 completions on 1,245 attempts (64.8% completion percentage) for 10,693 yards and 99 touchdowns with just 23 interceptions. He is USC's all-time leader in career touchdown passes and completion percentage, and is second at USC behind Carson Palmer in completions and yardage. He averaged nearly 8.6 yards per attempt, and averaged only one interception every 54 attempts. He was 37–2 as a starter. Leinart was considered one of the top prospects in the 2006 NFL Draft class. Standing 6 ft 5 in (1.96 m) and weighing 225 pounds (102 kg) and a left-handed thrower, he was considered the prototypical NFL quarterback in terms of size but with a weak arm. Leinart was selected tenth overall in the 2006 Draft by the Arizona Cardinals. Leinart at a Cardinals practice. Leinart spent four seasons with the Cardinals, primarily as backup for veteran Kurt Warner, who he was supposed to succeed as starter. In his first season, after a contentious negotiation making him the last member of the draft to sign a contract, Leinart agreed to a six-year, $51 million contract on August 14. and not before Cardinal coach Dennis Green said that he had lost his patience. Leinart played in the second quarter of the exhibition game against the New England Patriots on August 19. Leinart started the fourth game of the season, in which he threw two touchdown passes. During the previous week, Leinart was rumored to get the starting quarterback position after a poor performance by Kurt Warner in the previous game. Coach Green even held a conference to state that Warner would still start that week's game. In Week 6 against the 5-0 Chicago Bears, Leinart threw for two touchdown passes in the first half, but the Bears came back in the second half to win 24-23. In a November 26 game, he set an NFL rookie record with 405 passing yards in a loss to the 6-10 Minnesota Vikings. His quarterback rating was 74.0. He suffered a sprained left shoulder (throwing arm) in a week 16 win over the San Francisco 49ers. In 11 starts, Leinart threw for 2,547 yards and 11 touchdowns. He finished the season with a 4–7 record. Leinart opened the 2007 season on Monday Night Football against the San Francisco 49ers as the starting quarterback. After a sequence of quarters in which the offense stalled, Whisenhunt began to insert Warner as a situational quarterback. On October 7, 2007, Leinart suffered a fractured left collarbone after being sacked by St. Louis Rams linebacker Will Witherspoon. Three days later, he was placed on injured reserve, ending his season. In his first two NFL seasons, Leinart had suffered two season-ending injuries within a period of five sacks. With Warner at the helm for the remainder of the season, the Cardinals mounted a late-season surge and won five of their final eight games. In Leinart's second season with Arizona, he started five games, completed 53.6% of his passes (60/112) and threw for 647 yards, 5.8 yards per attempt, two touchdowns and four interceptions. His passer rating was 61.9. He averaged 129 yards and 0.4 touchdowns per start. In the 2008 offseason, after he recovered from the injury, Leinart was handed his starting job back, but his hold on the job was tenuous after another strong training camp performance by Warner. Finally, after Leinart threw three interceptions within a matter of minutes versus the Oakland Raiders in the third preseason game, Warner was named the opening-day starter. Leinart picked up only a limited number of snaps in mop-up duty behind Warner. Warner started 16 games and took the Cardinals to their first ever Super Bowl, cementing his status as starter and Leinart's status as a backup. For the 2008 season, he completed 15 of 29 passing attempts (51.7%), one touchdown, one interception, and an 80.2 passer rating. In 2009, Leinart continued his role as back-up for Warner, who started all but one regular season game. In 2010, he was named the presumptive starter after Warner's retirement; however, he lost the starting job in training camp to Derek Anderson. The Cardinals released Leinart on September 4, two days after the final preseason game, in favor of Anderson and rookies Max Hall and John Skelton. On September 6, 2010, the NFL announced that Leinart signed a one-year contract to back up Matt Schaub with the Houston Texans. Since Schaub played all 16 games, Leinart did not play during the 2010 season. During the 2011 offseason, despite speculation that he would sign with the Seattle Seahawks, who were coached by Leinart's college coach Pete Carroll, and compete for a starting job, Leinart ultimately agreed to return to Houston as a backup for the 2011 season. In week 10, Schaub injured his right foot and the Texans named Leinart their starter. Leinart started for the first time in week 12 against the Jacksonville Jaguars; however, during the first half he fractured his collarbone and was replaced by rookie quarterback T.J. Yates. At this point in his career, Leinart had suffered three season-ending injuries (2006, 2007, 2011) within his last 8 starts. On March 12, 2012, Leinart was released by Houston. Leinart signed with the Oakland Raiders on May 1, 2012, as the back-up to his former college teammate, Carson Palmer. After Palmer suffered an injury in Week 16, Leinart and Terrelle Pryor split first-team reps. Pryor ended up getting the start in Week 17 and Leinart was not re-signed the following offseason. After injuries to quarterbacks E.J. Manuel (knee surgery) and Kevin Kolb (concussion), the Bills decided to sign Leinart on August 25, 2013. Leinart and Thad Lewis (who was brought in on the same day through a trade) would compete for the 4th QB job behind undrafted rookie Jeff Tuel. Lewis won the competition, and Leinart was released on August 30, 2013. Leinart has a son with former USC women's basketball player Brynn Cameron. Leinart broke up with Cameron before the baby was born. Though they had a dispute over child support early on, they have since settled their differences and Leinart now has a regular schedule for seeing his son. ↑ The championship was later vacated by the BCS on June 6, 2011, following the imposition of sanctions by the NCAA, including vacation of games during the 2004 season. ↑ Ben Bolch, "Leinart Chosen State Player of Year", Los Angeles Times, December 5, 2000. Retrieved July 16, 2008. ↑ Ben Bolch, Leinart, Hart Keeping Options Open, Los Angeles Times, October 31, 2000. Retrieved July 16, 2008. ↑ David Wharton and Ben Bolch, USC Recruit Leinart Waits to See Who Will Be Coach, Los Angeles Times, November 29, 2000. Retrieved July 16, 2008. ↑ Chris Dufresne, "Timing Isn’t Entirely on Carroll's Side", Los Angeles Times, December 16, 2000. Retrieved July 16, 2008. ↑ Ben Bolch, "Recruits Seem to Be Committed", Los Angeles Times, December 5, 2000. Retrieved July 16, 2008. 1 2 David Leon Moore, "Booty carrying on USC's quarterback tradition", USA TODAY, August 3, 2007. ↑ "Once anointed as USC QB, Sanchez asserted himself", ESPN.com, July 24, 2008. Retrieved July 28, 2008. ↑ Profile, espn.go.com; accessed August 25, 2014. ↑ Brian Heyman, "USC's Bush leaves Heisman field in his wake", USA Today, December 10, 2005. ↑ ESPN - Arizona Cardinals cut ties with QB Matt Leinart, September 5, 2010. ↑ "Matt Hasselbeck leaving Seattle Seahawks; Tarvaris Jackson agrees to deal". Espn.go.com. 2011-07-27. Retrieved 2012-10-04. ↑ Floyd, Brian (2011-07-26). "NFL Free Agency: Matt Leinart Still An Option For Seattle Seahawks - SB Nation Seattle". Seattle.sbnation.com. Retrieved 2012-10-04. ↑ O'Neil, Danny (July 27, 2011). "Matt Leinart staying put in Houston". The Seattle Times. ↑ Matt Leinart, Eric Winston tweet cuts, ESPN, March 13, 2012. ↑ Copeland, Kareem (2012-12-26). "Oakland Raiders' Terrelle Pryor, Matt Leinart split reps". National Football League. Retrieved 2012-12-26. ↑ Sessler, Marc (2013-08-30). "Matt Leinart released by Buffalo Bills after five days". National Football League. Retrieved 2013-08-30. ↑ "Matt Leinart, Brynn Cameron Have a Son", people.com; accessed August 25, 2014. ↑ Billy Witz, "U.S.C.’s Cameron Balances Basketball and Motherhood", The New York Times, March 13, 2009. Wikimedia Commons has media related to Matt Leinart.